This exercise will give your students practise identifying proper nouns in sentences. 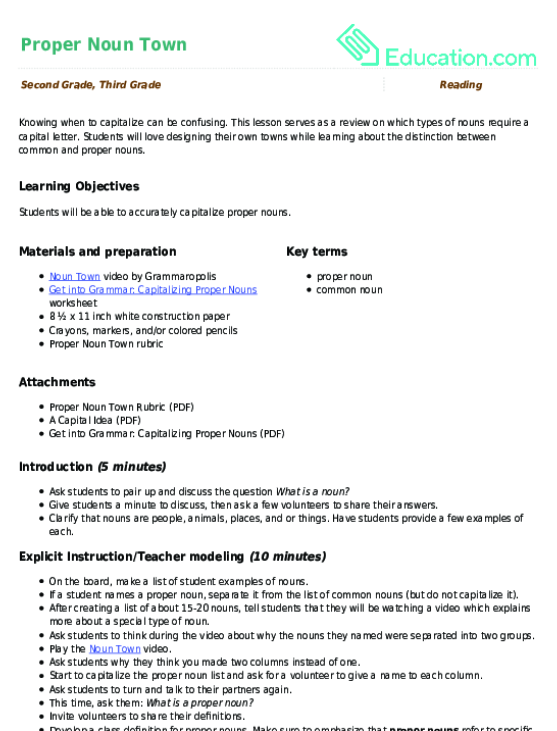 This lesson serves as a review on which types of nouns require a capital letter. Students will love designing their own towns while learning about the distinction between common and proper nouns. Nouns can be people, places or things, but what about nouns that you can't see or touch? Help your little one master her abstract nouns with this fun series. This worksheet will help young writers get creative with abstract nouns and learn how they differ from concrete nouns. This worksheet provides 10 sentences with abstract nouns. Students will read each sentence and circle any abstract nouns they identify. Help young writers identify abstract nouns and learn how they differ from concrete nouns by seeing them used in context.